A fleet of 12 Yellow Cabs was used by the Kraft Foods Co. to rush margarine from a transfer point at Haddonfield to grocery stores in the Philadelphia area. Bootlegging booze is one thing, but a butter substitute is another. In the first half of the 20th century, in the midst of a war over the highly profitable butter market, Philadelphians smuggled yellow margarine across state lines. Runners crossed the Mason-Dixon Line so frequently, according to Strange Philadelphia: Stories From the City of Brotherly Love, that a sign posted near the Pennsylvania border read: "You are now leaving Maryland. Stock Up Here!" It started in 1869, after French chemist Hippolyte Mège-Mouriès answered Emperor Napoleon III's call to whip up a cheap butter substitute for sailors and poorer subjects. Mège-Mouriès invented the substance after churning together beef oil and milk, dubbing his creation oleomargarine. By the time it reached U.S. shores, the substance had been dyed yellow and priced below butter, two hallmarks it would retain for years to come. American dairy farmers, threatened by the competition, pressured state governments to do something. In 1884, New York banned the substance, followed swiftly by several more states, including Pennsylvania. In 1886, the dairy lobby pressured Congress into levying a federal margarine tax of 2 cents per pound, and required grocers and distributors to pay annual fees. In the 1890s, federal restrictions prevented manufacturers from adding artificial dyes, forcing them instead to sell the margarine in its natural, white form so it wouldn't so closely resemble its rival. Several states even passed laws requiring margarine to be dyed pink to distinguish it from traditional butter. After the Supreme Court ruled in 1894 that colored margarine could not be transported into states with a colored-margarine ban, margarine firms had to get creative. As a workaround, companies would include a packet of yellow dye with the white spread, instructing housewives to color it themselves at home. While the tax climbed to 10 cents per pound in the early 1900s, tides began to turn during World War II. Butter shortages drove consumers to margarine. What had long been considered a low-income substitute was being used by more than half the country's population. The federal tax was lifted on July 1, 1950, which affected 33 states and Washington, D.C. But 15 states, including Pennsylvania, still prohibited pre-colored margarine. In August 1951, agricultural committees in both the state Assembly and Senate pushed through bills that permitted the sale of pre-colored yellow margarine in plainly marked one-pound packages, but for home use only. It could not be served or used in hotels or restaurants. Gov. John S. Fine signed it into law at 11:10 a.m., Aug. 24, 1951. Within seconds after the bill was signed in Harrisburg, the Inquirer reported, supplies were being ushered into markets and stores throughout the state. One firm flew its first shipment into Philadelphia International Airport. 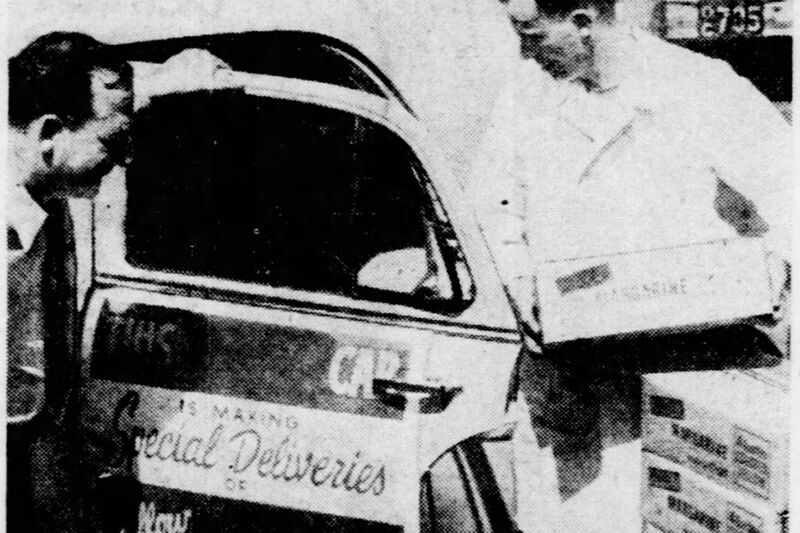 Kraft Foods Co. employed a fleet of 12 Yellow Cabs to rush margarine from a transfer point in Haddonfield to grocery stores in Philadelphia and the surrounding counties. It normally would take 10 days after such a law for supplies of the new product to reach grocers' shelves, but distributors sped up the process to dramatize the event. They expected to "blanket the state with a supply of yellow oleo within 24 hours."